Our Carrier air conditioner is fifteen years old. Last summer, it kind of died in late August. Since the weather was fairly mild, we managed by opening up the windows and using fans. However, when July weather hit in early June, it was pretty clear that we’d need to fix it or replace it for the summer. Being ever so handy with tools, Matthew went out to look in the access panel and found more carbon than he should have. 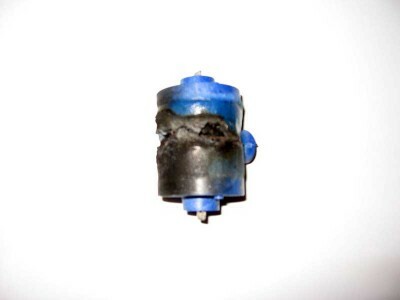 Apparently, the ceramic capacitor had released its magic smoke, which did a great deal to explain why the fan blades had stopped turning–there was nothing to impel them to start rotating. So, a blown capacitor. It should have been an easy fix, right? Call around to HVAC shops, find one with the part in stock, that sort of thing. Oh, but no. I started by calling Yorkshire Plumbing Supply in Manassas. Unfortunately, they didn’t carry much in the way of HVAC equipment, but they kindly referred me to Lyon, Conklin & Co. in Chantilly. Unfortunately for me, Lyon, Conklin is in the business of parts wholesale, not retail. Okay, I could handle that. I wasn’t in the market for a gross of capacitors. Next, I had a bit of an idea and called Sears Parts & Repairs. They would love to have sold me a replacement part but unfortunately, they didn’t carry parts for Carriers. Again, reasonable. The service representative did give me the phone number of Carrier. Carrier was kind enough to give me the name of their dealership in my area, and I promptly called ARS Service Express of Manassas. This phone call, however, did not go as swimmingly as I might have hoped. The only way they would sell me a part for my air conditioner was if they made a service call. Because clearly, I’m an idiot who can’t spot a blown capacitor. Matthew did a good deal of googling and came up with a page on the Arnold’s Service Company web site. It had a picture of what appeared to be exactly our capacitor (minus the scorch marks) as part of a Bryant/Carrier Thermal Start Kit. We took a chance and ordered it, as it was still cheaper than getting a repairman out to replace the part and bill us for labor. I am a totally happy and satisfied customer of Arnold’s Service Company, which is a do-it-yourself-er’s dream. 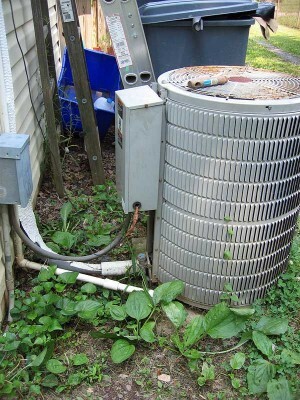 The not-so-good news is that the AC unit needs a freon charge (which is typical), so we still don’t have AC. However, we’re one step closer to, oh, being able to get through the day without a mid-afternoon meltdown. (However, it does work and cycle on; the low freon charge is just preventing it from being able to produce enough cold air to make a difference.) Guess I’ll be calling Sears again tomorrow. This entry was posted in Live and tagged howto, hvac. Bookmark the permalink. And I know Sears didn’t sell you freon as you need to be licensed by the EPA to purchase and handle R-22. Of course they don’t sell freon. I was calling Sears as they have an HVAC department that does house calls for things like charging the freon on an AC unit. What is the model and serial number of your unit. Mine looks just like it but the label is missing. I’m sorry, I don’t have that information. We ended up replacing it in the spring of 2011. I would just like to say if you think charging a unit once a year or however often you need to add freon, that is not typical and you have a leak that needs to be fixed. We replaced the unit in the spring of 2011. I think it actually needed a freon charge twice while we owned it between 2000 and 2011. 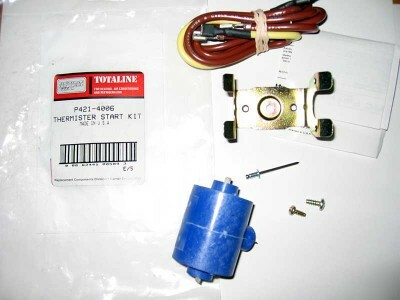 I have a similar CARRIER START THERMISTOR HC95XX020 like yours. My problem is i don’t know where to connect the wire to. Do you connect the top wire to Herm and the bottom wire to the Common of the capacitor? Mr. Arnold is such a nice person. I had to order a capacitor from his company and he was so helpful. He is truly the best person I have ever purchased AC parts from. can’t say enough good things about this gentleman.